Pointing out that this game got awards for "best gameplay" and "best puzzles" in 2002 is more of an insult to every other game released that year than anything else. The fact is, the game looks good and sounds good, but is otherwise a waste of time. The multiple repetition of clicking the same object until something finally happens is one of the most blatant signs of bad game design. The length of the game is pathetic, as you can literally finish it in under 30 seconds once you know what to do. Imagine trying to make a demo of this game... it's just not possible. It's as if this WAS the demo for a game that was never made. Pretty fun little game =] not bad. ...not that good, imo. there are far too few animations, the sniper bit was a bit clumsy and if you run ot of bullets u just have to start again or reload. i did this cos i was just firing randomly and i assumed i could get more bullets. it may me an old one and its the authors first game, so i guess its not that bad, but its certainly not one of the best, oh and whats the title about?? Congratulations, you made a very interesting little game from a simple idea. Fun little game to play once around. The replay value isn't extremely high because of the lack of humor element and length, but the puzzles are well-thought out and creative. A good game for its length. I especially liked the random position of the sniper. Nice touch! I was so stupid that couldn't find wasdx-keys.... And there is no something about using sniper-mode... There is no ANY help-files. I'm just shooted in varios windows and with the last bullet killed this sniper. I didn't inderstood the logic of shooting and walked to walkthrough. And I was very surprised cause camers required. P.S. all those who crying about boards on window are loosers. VERY COOL GAME!! I enjoyed every second of it :D PROPS!! Very,Very,Very short game. But it was ok. if you have 10 minutes to kill.. It's hard to review this game because it's an "oldie". Although I'm not sure of the exact date, it was probably made in 2002, judging by the first comments on this page. Anyway, with that in mind, I can't help but give a good rating at this game's graphics, they were definiterly on par with some commercial games of the early nineties, so they're good, not mind-blowing, but good. The rest of the game, however, is somewhat below average. For instance, one of the first things I wanted to try and do was to pull the corpse by its feet, or at least crawl under the window, unfortunately, the main character is incapable of performing these actions. There's also some "forced repetition" in the puzzle where you have to click several times to get something. I understand this makes the game longer, but it's bad design, and has the potential to frustrate some players. Furthermore, when you first try to go past the "killer window", the game allows you to die but, after you solve the problem, your main character no longer wants to interact with said window at all... it would be nice if the gamer had the freedom to try anyway. Still, once you get past these logic limitations, you actually find a very appealing little game (keyword here being "little"). The idea of being in mortal danger and having to "snipe the sniper" is enticing, and the last puzzle, which allows to pinpoint the location of the enemy sniper is particularly clever. Sadly, once you get your enemy, the game is over which means that, once you figure out what you have to do, this game will take you around 60 seconds to complete. Overall, I'll give it a 3 out of 5 due to its age and the fact it has a good story, along with above average graphics. The low points I described above prevent it from deserving a higher rating, but I can picture a longer sequel to this game where all of them could easily be fixed, so congratulations to the author for a fine effort nonetheless. Hope to see more like it. The puzzles were a bit on the annoying side. The boards on the window.... AAARGH! Luckily you can't get stuck in a one room game and at the end of the day the puzzles are fairly logical. The story... well there is no story to be honest. No motives are revealed and after the six minutes it takes to complete this game you end up with a lot of questions like: Why? Who? When is 9 Days a Something coming? *INSERT A WITTY QUESTION HERE*? There's one piece of music in the background that doesn't annoy but doesn't swing the other way either. There are only a few sound effects and to support the atmosphere more would've been needed. Wow! This is a good game... the puzzles were not too easy, nor too difficult... but could you please make the last 5Â½ days? Awesome game??? Are you guys on crack? This game's a demo! It shouldn't even be considered a real game. I could beat it in 1 minute now that I know the solution. Worse yet, without giving away the ending, the game does not give you any information with regard to the premise of the story. Just beat it and you'll see what I'm talking about. Also, what's up with the silly logic in this game? This one wasn't as bad as 5 Days a Stranger, but doesn't a professional assassin know how to crouch? That would have taken away 10 out of the 40 minutes or so it took me to beat this game. The problem with these adventure games is that they are BRUTE FORCE. I want people to use this term a lot to describe adventure games cause that'll save me the time of downloading them and going through a miserable time. The fact that this game takes place in one room makes the brute force element even worse. To be stuck in a series of maps is horrible, but to be stuck in one room with like 10 clickable elements is a nightmare! Most of the puzzles are hard only because the visual cues in the game are poor. For instance, rather than clicking on any board of the boarded up window, you have to click on specific ones at different times. The game gives you no message that you're clicking on the wrong one, so since there's no board that looks different, you naturally assume that what you were doing doesn't work on any of the boards. Furthermore, the game is not just simple trail-and-error, it requires that you do the same actions multiple times on the same thing before it works, and sometimes there's no verbal indication of progress - so you gotta just go mad crazy clicking on everything multiple times even after messages indicating failure. I mean, come on! If we give games like this so much recognition, people will continue to add these horrific, illogical puzzles to their games, thinking that it's perfectly OK! The poor gameplay aside, the game uses too little sound and music. The quietness of the game does not serve to enhance the tension since the game just has a feeling to it that the programmer didn't bother to put in sounds, not that it's quiet for a reason (if so, you need footsteps or heartbeats or something). At least some atmosphere could have kept this game interesting while it lasted, but it has little of that since the scenery is bright and rather dull and the music and sounds are completely absent. Now for the good: the game has nice, pixelicious 256-color graphics. The animation isn't really up to par with the stills, but they certainly aren't bad. This was a nice game. Short, but sweet, a fun little game. It feels as if the game could go further, but I'd definitely recommend playing overall! Liked this small game. Good use of puzzles in one room. One of those where I finnished wanting more. Short but perfectly formed. No lengthly 12 room walk between puzzles. Which was nice. A great adventure played out in a single room. Definitely worth playing. I don't want to say, but someone told me the graphics of this game is crap! Hehe I'm not kidding, but I love this game personallt. I was very immersed in the game, and in my opinion the best short game made with AGS. The puzzles were simple, yet hard to figure out. They were those kinds of puzzles where after you figure it out you say "D'oh! Duh!!!" Short, but fun and challenging. 8/10. Fantastic game, good and consistent art style, no music but that suits it, short, precise and with some great ideas. This is an awesome game. Its short, but hard! Good work! Tis a strange game. Weird how we all like it when its so short. I liked it coz all the whole sniper era. I think snipers are popular for computer games. A bit short but surprisingly exiting one. Too bad it ends just at the moment when you realize that thing you see on your screen is one of the best and background music is listenable (what a word) for hours and hours! And this is true magic. Great! Five stars is right! I liked the gameplay. Nice clean pictures, fast, good logic involved. I almost cried when it was over. Very impressive! I'm still stuck at the moment but I ain't gonna give up! The game drew me in from the minute it started. Great gameplay, great graphics, great plot...great EVERYTHING!!! Well Da Crump like the graphics! A nice little game, just as hard to solve as it ought to be - well done. This was a really fun game. Nicely made, but way too short. Nice hob Eric! it was easy, i want it is longer. The game is a bit easy, but an excellent idea and a well done game. Make a sequel or something, but make it longer. By the way, this game isn't very hard...it's one of the few AGS games I actually beat easily without any hints. A great and promising game. 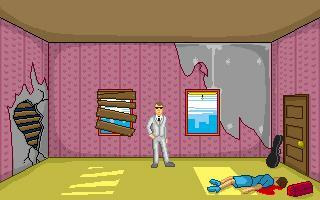 Nice smart puzzles and scripting and "eric" quality graphics. Very short though. Please eric! do a longer ame...PLEASE! That's a Grim Fandango quote, isn't it? Anyway, this game, even though it's hard, is really spiffy. 4.75 stars. It misses .25 stars because I'm still sore from smacking myself on the head for one mistake I made that made me have to start over. This game is freakin hard don't download it! This is the first game like this I have ever played, and it was really fun. It was challenging and definately worth the download! I love it! A nice short game with great puzzles. Good observation and thought is required to progress, and realising where the visual clues are in the scene is very satisfying. An enjoyable few minutes. This game is easily one of top games AGS has to offer. Eric masterfully uses the one room idea (though, strictly speaking, this game has more than one room), to mold an interesting and compelling story line. The puzzles, ristricted to the small space, are very well done. The only complaint, would be the shortness of it. You want more, not because it's left unfinished, but because it is a great game. Play it! Really Flippin' hard. I actually gave up. This game may only be one room long- but it is superbly crafted for pure and utter pleasure. "meow, baby?" I'd give it 5 stars , but I'm all out.